My first Pyrenean and I met in 2009, my partner and I had split up , and our two GSDs stayed with him, He wouldnt let them go and I have grown up with animals, we have always had a dogs in the family (and cats and anything else that needed a home) (my family have always been involved in Animal Rescue , currently parrots). I knew it was a only a matter of time before another dog came to share my life , (I just didn't know which breed) and then fate as always stepped in. In march of 2009 I went to Castleford Pets, a small local pet shop in my area, and there in the garden was a beautiful, huge white male dog, happily opening the conservatory door to his home. I was fascinated, I watched him for a while ( It was at this point that I think I fell in love) I asked the owner numerous questions and he told me that they used to show their dog, but didn't anymore , the owner gave me a lady's name where I could get more information. I contacted Joyce Stannard from the PMDC GB, who gave me much of the information I needed, then on to the Internet I went checking, researching and looking for any information I could find . Having done my homework, I decided that this was the breed I wanted, so on I went to find a puppy. I found a breeder in Gloucester who had 1 puppy left a little girl, so I called her then travelled up to Gloucester and met Belle who was to be my first Pyrenean. I decided I wanted to show my dog and Belle was a dream , as soon as she was old enough , off we went to KC Puppy Foundation classes, Obedience Classes, and Ringcraft , this was something new to me , I had never shown a dog before, and we both really enjoyed it. When it was time I started entering her into Competitions, then , sadness , she was diagnosed with problems with her legs, so sadly , she couldn't show but what a fun time we had getting her ready , bathing was always the best. 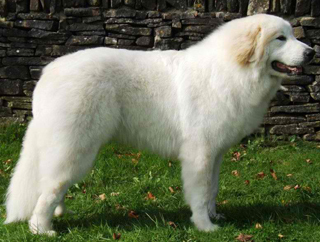 Once you have one Pyrenean you are hooked these dogs are so wonderful and soon enough I longed for another one. At a show I met, Christine and David Edwards and their beautiful dogs. I am very lucky that they have trusted me with their beautiful male dog, Shane. he is the love of my life, he truly has changed my life. From the minute he walked into our world , he ruled it. He is the most wonderful gentle, beautiful dog , he is our main Show dog and Master of the house ! !, He is spoiled rotten and none of us would ever be without him now. Hes my 'boy'! This was not the end of our family, Misha joined us as a puppy , she is a lovely girl, still very young and started her show career, she recieved her stud book number , and we now have Misha as our companion dog she comes to the shows with us for the journey but does not show as she is soooo big ! We then got another ! puppy off Christine and Dave Edwards , this one we called Elsa , she is beautiful and has had a huge succesful career in the show ring , she has a RCC and many first behind her we are very proud . That's a beautiful story. Us too have fallen in love with the Great Pyrenees and can't imagine having any other breed. We are hooked and now have a puppy 18 weeks young :) Your dogs are just beautiful! It is great that you have such a good and trusting relationship with your pet. The dog will always remain faithful in any situation.